When one of its older sites in Melbourne was slated for a complete rebuild, BP immediately recognised it had a golden opportunity to create a concept store that would offer a glimpse into the future of petrol and convenience retailing in this country. While existing stores can be renovated and refitted in an effort to meet changing customer expectations, building something from scratch offered a chance to really embrace all the new trends in the industry and to explore a totally new approach. An awful lot of research and planning then went into the creation of BP Kings Way in a prime site in the Victorian capital, and early indications are that all the work has paid off. Since the site re-opened in early August, it has earned rave reviews from customers and sales have been strong. Sitting in a flagship location on a busy Melbourne arterial road surrounded by corporate offices, high-density apartment living and new developments, BP Kings Way was the ideal site for BP to launch its concept store, and to test its best ever in-store and café offers. Having decided the old premises on the site had reached its sell-by date, the old store and fuel systems were completely removed, the land was remediated, and the new store built. The new BP Kings Way has been meticulously designed to provide an easy experience for customers with varying needs. Self-service kiosks allow in-a-hurry customers to pay for their petrol or pick up a quick snack or drink and get back on the road quickly. However, the store also encourages those with a bit more time to linger. There is always a trained barista on site to make quality coffee, there are four seats inside and three seats outside for customers to use, and both WiFi and electric charging spots are available. The overall size of the site is not huge, but the shop itself covers approximately 250 m2. On the forecourt, there are six lanes dispensing the full suite of BP quality fuels; Unleaded 91, Unleaded 95, Ultimate Unleaded, and Ultimate Diesel. There are five car parks in front of the shop, and there is also a dedicated disabled car park, and an area for cyclists to lock up their bikes. Kings Way operates 24 hours a day, seven days a week with a dedicated manager, and a staff of more than 10 working on a roster system. All team members have been recruited based on their food, hospitality and customer service skills. With customers eating on the go more frequently and planning their meals in advance less and less, BP saw food as an important opportunity at Kings Way. With the notion of three seated meals a day and an hour of grocery shopping on the weekend no longer holding for busy Australians, the company made offering ‘Food for Now, Food for Later’ part of its customer mission. The extended food offer at Kings Way includes pastries and bagels baked in store, as well as healthy items such as protein-packed chia bowls, granola bowls and yoghurt. There are also sandwiches, wraps and salads ready to eat in store, or to be taken back to the office, apartment or car. Ready-made meals can also be bought to be taken away and heated up later. BP says the expanded food and coffee options are targeted at urban dwellers, while its pies and pasties remain popular with core customer groups. As well as quality hot coffee, nitrogen-infused cold brew is available on tap. 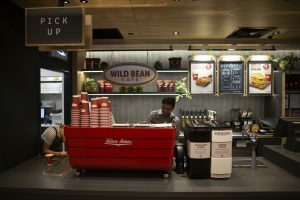 BP Kings Way says customers are interested in new coffee brewing methods and its Nitro Cold Brew coffee tastes great, is easy to serve, and can save in-a-hurry customers time. With Australians increasingly doing their grocery shopping via multiple smaller shops, BP Kings Way also has an extensive grocery section, selling everything from milk and nappies to sauces, meal kits and party supplies. The store’s interior is modern and fresh, and facilities such as an ATM, money transfer, and Hubbed parcel service are also available. While giving today’s busy customers what they want in terms of product is important, so too is delivering it to them efficiently. Customers in a rush can use the BPme app to pay for fuel from the comfort of their own car and Kings Way is already one of BP’s top 10 sites for the use of the app. The store also has two self-serve kiosks in the store. Customers can simply enter their fuel pump number, scan any shop items, swipe their Velocity card and then pay by card. BP says the self-serve kiosks and the BPme app ensure customers with a little more time don’t hold up those customers who are in rush. It says this makes browsing a more relaxing experience as customers are less pressured by the idea of losing their spot in the queue. “Customers are increasingly time pressed and at BP we’re committed to delivering a fast in-and-out experience,” said Adam Arnold, General Manager Marketing & Retail Innovation, BP Australia. While it is still very early days, customer feedback on the Kings Way store has been overwhelmingly positive, with particular praise given to the way the new layout makes the store so easy to use, and the friendly service. With the feedback relating to the suite of products, services, digital and operational innovations in place at Kings Way has been highly encouraging, BP says the quest for the ultimate store is nevertheless an ongoing one. It says it will continue to learn from its experience at Kings Way as it looks ever further into the future, and endlessly seeks ways to improve what it offers its customers.